The new £33m Scottish National Blood Transfusion Service (SNBTS) Centre of Excellence near Edinburgh has specified clay pipes from Hepworth Clay as an underground drainage solution, an approach that offers durability, long term performance and a low lifetime cost, according to the supplier. The new centre at Heriot-Watt Research Park will be a hub for processing, testing, supply, research and development for blood and human donor tissues and cells. The state-of-the- art centre will comprise laboratories, offices, ancillary buildings and parking facilities. 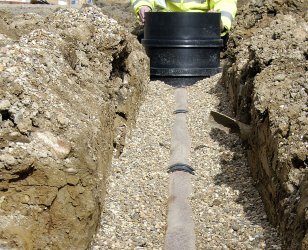 As part of the groundworks package installed by specialist contractor WH Malcolm, the requirement for the foul drainage in the laboratory areas led to the specification of Hepworth Super-Sleve clay pipes from Hepworth Clay to ensure chemical resistance, longevity, strength and a trouble free future. The durability of clay pipes is as much an advantage during its service life as it is for installation, says the firm. With a lifetime jetting guarantee, Hepworth pipes are able to withstand jetting pressure of 7500psi, at 20 gallons per minute held static for five minutes, allowing blockages to be cleared with reduced risk and in less time.